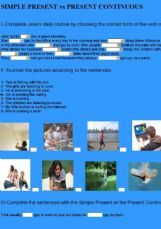 Ss fill in with the present progressive form of the verbs and match a sentence to a picture. 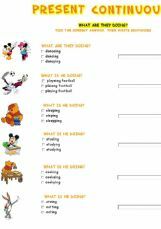 Some tasks to revise Present Continuous using animated funny pictures. Hope you like it. This OE is for practising the two present tenses - simple & continuous. 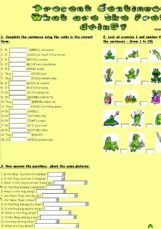 Lots of multiple choice practice suitable for elementary/low-intermediate students (based on my Ws I downloaded some time ago). Hope you like and find it useful! 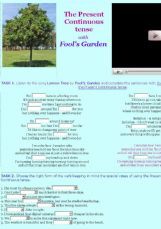 Students listen to the song Lemon Tree by Fool�s Garden and fill the gaps with the present participle they hear. 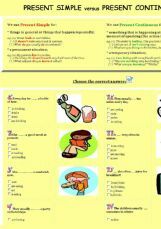 There are 2 more tasks on Present Continuous tense (including special cases). 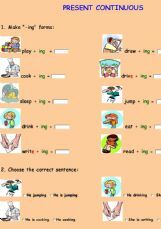 Choose the correct answer and write sentences / Complete the sentences and number the pictures / Order the sentences. Hope you like it! 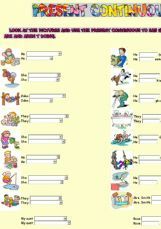 Easy exercises to practise both tenses. I hope you enjoy it.